We will be building a new house… soon. I know I’ve mentioned it before. More than once. And I will warn you now, I will mention it again in future. It’s just such a big part of life at the moment. We’re at the stage of really knuckling down and thinking about the details. We’ve chosen the house (great big gigantic YAY!!) but now it’s down to thinking about the carpets, tiles, bathrooms… the kitchen. I love black and white kitchens. White (inc glass) cabinets with lovely black (stone) tops. I find myself Googling black and white kitchen regularly… and then oohing and aaahing over my discoveries. I show every second one that has caught my fancy, to Mister… but he’s not as excited about the possibilities as I am. Hmmm... I wonder why? Aaaaah, all so pretty. I can’t choose which I love the most, but I do want my kitchen sink under a window… and a walk in pantry to be able store things out of the way. If you were to build a new kitchen, what would it look like? I love kicthen's but hate cooking in them go figure. But I love the look of the first one. Sounds a little like me. I like to cook, but hate the mess it makes. I'm a one-pot wonder! Those kitchens look amazing! When we build our house (still a few years away as we plan to pay off the tiny ugly thing we live in now first then level it to build a new one) the only requirements I have for the kitchen are lots of counterspace and big double sinks! I haven't started dreaming of colors or anything yet since it is so far off for us. Polyurethane cupboards that hide everything - the fridge, the preparation bench, etc, so that it just looks like a wall of cupboards with an island bench housing the sink and dishwasher (hidden of course) - I want my dream kitchen to be part of a large open plan living area that houses the kitchen, dining, living and sewing rooms! All facing a beautiful view - preferably of the ocean! It is unlikely to happen but I can dream, right? Ofcourse you can dream! You never know what the future will bring. Yes, I need to keep the "dating" in mind with the new house. There are so many funky modern kitchen and bathroom designs with cool tiles and sinks, but which probably won't age well. 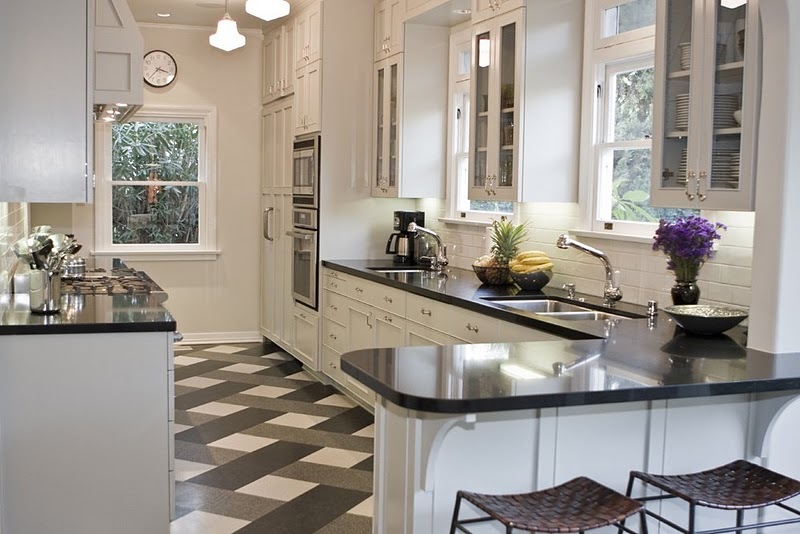 i`m fond of stylish kitchens, especially in 2 tones - black and white ones. I like the first one best! Love the B/W idea but not so much on the modern! The first one is more a 'French country' look and to me is much more warm and inviting! The last one (the retro) is kind of cool, too! How lucky you are to be getting a NEW kitchen! I hope to redo mine next summer and oh it cannot be soon enough!!! I can't wait either. The building should start in the next couple of months, but we need to decide on all of the plans soon. Fingers crossed we'll be in the new house by this time next year. Have you got your kitchen reno all mapped out in your mind? I can't imagine having the liberty of starting from scratch. It's been 20 years since I was able to do that and boy, would it be fun! My kitchen would have a lot of white/grey so I could mix color in using things I'd easily replace over the years. Enjoy! Oh, I love the third one! I'm a sucker for black and white tile floors. If I were building my own kitchen, my must haves would be a big ole gas range, an island with plenty of counter space, and some kind of cool tiled backsplash. I also really like the big, stainless steel industrial looking sinks like you see in restaurant kitchens. Makes washing dishes a cinch. I love your style!!! I agree a window over the sink and a walk in pantry!! I was immediately drawn to the floor in the third photo, that criss cross pattern is fabulous!! I want a walk in pantry too. A space to store all of the kitchen gadgets out of the way (the bread machine, food processors etc). Some of the walk-in (butler) pantries in the display homes we've looked at are almost as big as bedroom and include another sink, oven, fridges... all really too much. if you like to cook like i do, i chose cupboard handles that are easy to open with one finger( whilst all the others are coated in flour!!) also, i had a really narrow(12") cupboard next to the sink, that has all my baking trays and cake coolers in it ( coolers are up on hooks, hanging over trays) so easy to find trays. I put an old vinyl kids'place mat on the bottom, cut to size, so trays dont scratch bottom of cupboard. I like laminated counter tops... are tough... dark non shiny surfaces hide scratches over time.. shiny show everything and every mark. would have liked a marble slab for pastry work, but now i do more y east things ( which perfer warmth ) so marble top would have not been so great for this.. too cold. def window over sink.. with a decent ledge to put knik nacs on... if you are that kinda person ( I am.. we have the sugar bowl, toothpicks, cute things , jars for stamps and sugar packets etc) greek bowls and a bell or too... grand kids like to play with these.. we made ours just a bit wider when we redid the kitchen as was only a cup size deep.. now its two.. I'm hoping for a ledge over the sink (under the window) for my Violet collection. Hopefully it will be a happy space for them. A walk in pantry is a must! and I love white and black as a base with a splash of red or blue! The power points in the island (already suggested) are worth it, my MIL regrets not getting more power points in her island! I did eventually get to renovate the kitchen after 17 yrs and it has off white cupboards and black marble look laminate banchtops, including a large island that is the "quilting counter". We used "diamond gloss laminate" which looks like it's marble but isn't as cold as stone. We not only put a power point on the island, but a network cable as well (for the times you want faster computing than wirless can give!!!) A walk-in pantry is great if you have the space to do that, I didn't, but love the fact that I have drawers in the pantry...the top half is shelving and in the bottom half are two shallow drawers and one deep drawer. When you get your oven, make sure that the baking trays will fit in the sink that you choose...sink tubs are deceptively small on paper! I was fortunate enough to recently get my 'dream' kitchen. If budget wasn't an issue I would have had things a little different but I love my all white kitchen with a bright blue glass splashback. Its very coastal looking with huge sliding (triple stacked) windows/doors to the side of it. So loads of natural light. It allows me to see the kids outside, at the dining table or in the lounge so its perfect. I did put the sink in the island for practical purposes only. I'm not a fan of it but put it down one end to allow for some bench space too. The idea of putting the power points in the island is a must. It allows the kids to mix whilst sitting at the breakfast bar/island or use a computer. I got two 60cm shop stock ovens for less than the price of one 90cm I had originally intended to purchase. So now I can have varying temps for my cooking. Such a pleasure now. All the best in deciding. Really go for the details now rather than at the last minute as it can be stressful deciding on the spot. Your kitchen sounds amazing!! Yes, I’ve added power points on the island for next time we get together with the builders. Something I’d never thought of! !